Looking for ways to give? CNM is a 501C3 non-profit organization that operates by the generosity of others like you. Would you consider a tax-deductible donation to our ministry? Donate online or by mail. Get to know us more through our blog, email updates, and Craig’s radio show on The Word 100.7 FM in Dallas, TX each Sunday at 11am. Or listen online to our podcasts below. 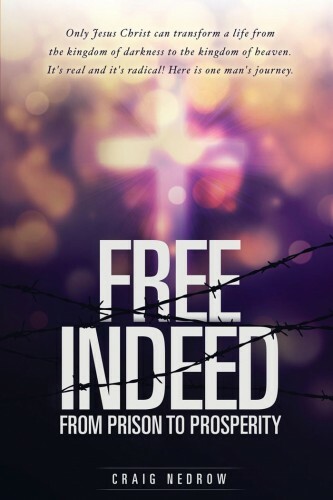 “Free Indeed” recently won a Christian writers award in the category of Auto-biography. This is another example of God’s hand of favor at work in Craig’s life, especially considering the fact that this was Craig’s first book. Please get a copy for yourself and for some one you know that may be struggling in some area of their life. All proceeds from the book go to sending books and Bibles into the prisons. Like the sample? Get the full version! New podcasts of our radio show coming very soon! Free Indeed Wins Christian Writers Award! Free Indeed won a Christian writers award in the auto-biography category. Pick up your digital or hardcopy today!